Last Tuesday, June 23, the website Wikileaks (in cooperation with Libération and Mediapart) published a number of NSA-documents showing that between 2006 and 2012, NSA had been able to eavesdrop on the phone calls of three French presidents. This is the first time we see actual finished intelligence reports that prove such eavesdropping, and being classified as TOP SECRET//COMINT-GAMMA they are much more sensitive than most of the documents from the Snowden-archive. Also it seems that these new Wikileaks-documents are not from Snowden, but from another source, which could be the same as the one that leaked a database record about NSA's eavesdropping on German chancellor Merkel. On Monday, June 29, Wikileaks published two Information Need (IN) requests and five additional intelligence reports, but the latter are not as highly classified as the ones revealed earlier. François Hollande and prime minister Jean-Marc Ayrault, May 22, 2012. 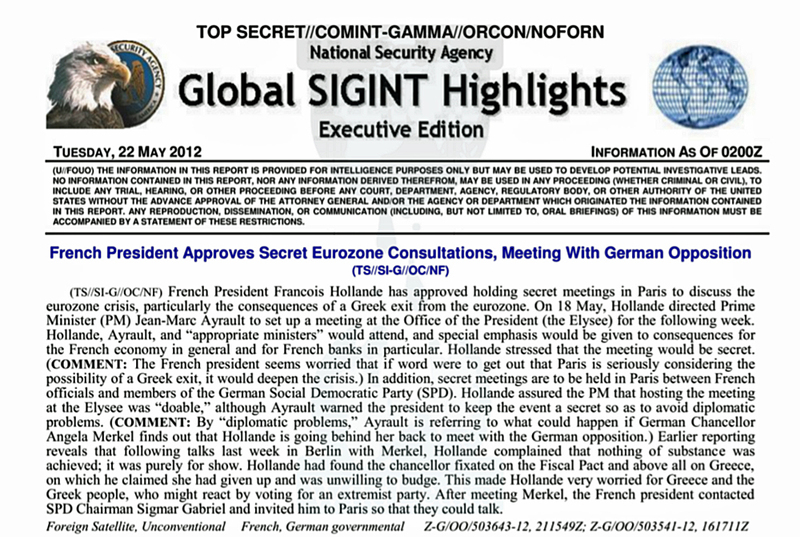 The reports are from various editions of the "Global SIGINT Highlights - Executive Edition" briefings. Only one report is published in the original layout with header and a disclaimer, the other ones are just transcripts, probably because they are taken from pages that also contain reports about other countries. For Wikileaks it is very unusual to disclose documents in such a selective way. According to the internal NSA newsletter SIDtoday from October 19, 2004, the Global SIGINT Highlights evolved from the SIGINT Digest, which was NSA's sole contribution to the initial 1995 prototype of Intelink, a secure intranet of the US intelligence community. The newsletter contains or is based upon so-called Serialized Reports, which are "the primary means by which NSA provides foreign intelligence information to intelligence users", most of whom are outside the SIGINT community. Such a report can be in electrical, hard-copy, video, or digital form. Conversation between president Jacques Chirac and foreign minister Philippe Douste-Blazy. Positions of president Nicolas Sarkozy. Conversation between the French ambassador in Washington Pierre Vimont and Sarkozy's diplomatic advisor Jean-David Levitte. Conversation between president Nicolas Sarkozy and foreign minister Alain Juppé. Conversation between president François Hollande and prime minister Jean-Marc Ayrault. For most of the five initial, and for all five additional reports, NSA's source of the intercepted communications is "Unconventional". It's not clear what that means, but phone calls between the president and his ministers will in most cases be handled by a local switch and therefore don't go through the intercontinental submarine fiber-optic cables, where they could pass NSA's conventional filter systems for telephone and internet traffic. For intercepting this kind of foreign government phone calls, NSA would have to have access to the public telephone exchange(s) of Paris or the private branch exchanges (PBX) of the presidential palace and important government departments. This would indeed require unconventional methods, like those conducted by the joint NSA-CIA units of the Special Collection Service (SCS) who operate from US embassies, or NSA's hacking division TAO. According to a book by James Bamford, NSA had an Office of Unconventional Programs in the late 1990s, which in another book was presented as NSA's own equivalent of the SCS units. It is not known whether this office still exists or has evolved into another division. 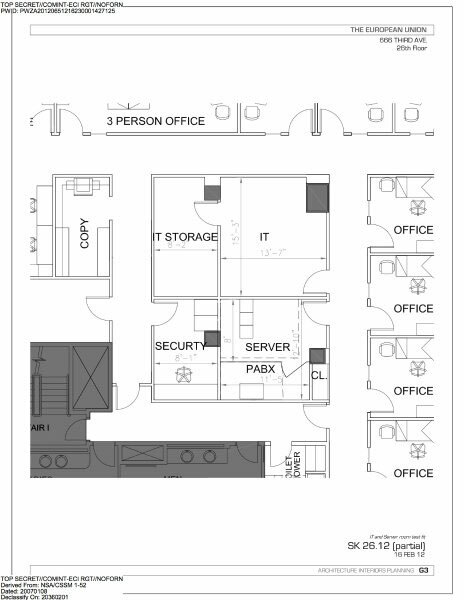 A 2010 presentation (.pdf) says that RAMPART-A is "NSA's unconventional special access program". This is about cable tapping in cooperation with Third Party partner agencies, but seems not the means to get access to local government phone calls. In one case, the source is "Foreign Satellite" (or FORNSAT), which is the traditional interception of the downlinks of communication satellites. This method was probably used because president Hollande visited his American counterpart in Washington a few days earlier. In yet one other case, the method is "Unidentified", and although Wikileaks says it's about an "intercepted communication", the actual report only reflects the positions of president Sarkozy, without mentioning a conversation counterpart. structure that is probably used for spying purposes. Looking at the classification level of the reports shows that they are TOP SECRET//COMINT-GAMMA when the president is involved in the conversation. Intercepted communications between ministers and/or top level advisors, diplomats and government officials are "only" classified as TOP SECRET//COMINT. Three of the reports have the dissemination marking NOFORN, meaning they may not be released to foreigners. The other two may be released to officials with a need-to-know from agencies of the Five Eyes community. Four of the reports also have the marking ORCON, meaning the originator controls dissemination of a document, for example by imposing that it has to be viewed in a secured area, or by not allowing copies to be made. Probably most remarkable about these reports is that they are from the GAMMA compartment, which protects highly sensitive communication intercepts. 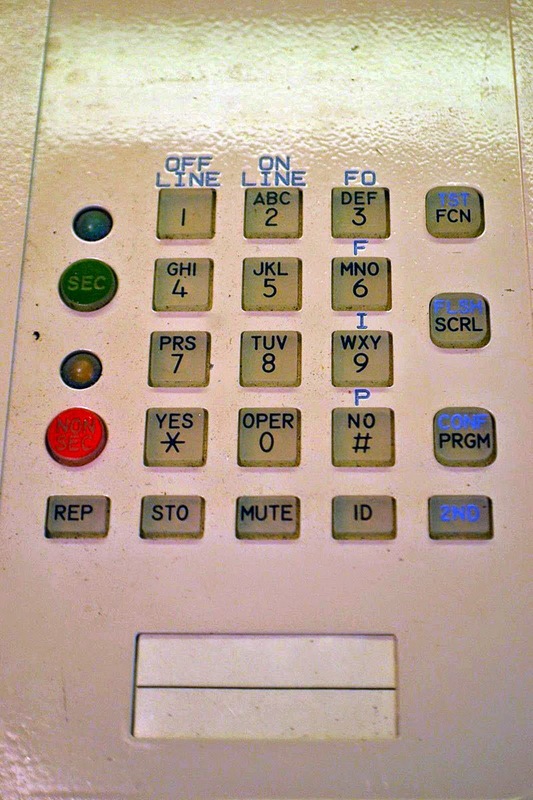 It was already used in the late 1960s for intercepted phone calls from Soviet leaders. The overwhelming majority of the Snowden-documents is classified TOP SECRET//COMINT, with COMINT being the control system for signals intelligence which covers almost anything the NSA does. All those powerpoint presentations, wiki pages and daily business reports are therefore not the agency's biggest secrets. It is not clear whether Snowden had access to the GAMMA compartment. So far, no such documents have been published, except for five internal NSA Wiki pages, for which the highest possible classification was TOP SECRET//SI-GAMMA/TALENT KEYHOLE/etc., but without GAMMA information being seen in them. Only a few of the Snowden documents that have been published have a more special classification: we have seen a document from the STELLARWIND and the UMBRA control system, as well as from the ECI RAGTIME, but it is possible that Snowden found these as part of his task to move documents that were not in the right place, given their classification level. Besides the source and the topic, there's also a serial number and a timestamp below each report. The time is presented according to the standard military notation. 161711Z for example stands for the 16th day, 17 hours and 11 minutes ZULU (= Greenwich Mean) Time, with the month and the year being that of the particular briefing. The Producer Designator Digraph (PDDG) consists of a combination of two letters and/or numbers and designates a particular "collector", but it's not clear what exactly that means. The serial numbers mentioned in the reports about France all have OO as PDDG. That one is not associated with a specific interception facility, and therefore it might be a dummy used to actually hide the source in reports for people outside the agency. According to the 1996 book Secret Power by Nicky Hager, the five UKUSA partners have the following identification codes: GCHQ: AA, DSD: EE, GCSB: II, NSA: OO, CSE: UU, which indicates that OO in the serialized report numbers means they were produced by NSA. Besides the NSA intelligence reports, Wikileaks also published an database extract which includes the (landline and/or mobile) phone numbers of significant French political and economic targets, including the office of the President. Because this list is about phone numbers, it seems most likely from a database system codenamed OCTAVE, which kept the selectors used for instructing the various collection facilities. It was reportedly replaced by the Unified Targeting Tool (UTT) in 2011. Selector: Shows the particular identifier to select the communications that have to be collected, in this case a phone number. +33 is the country code for France, the third digit being a 1 means that it's a landline (Paris area code), being a 6 means it's a mobile phone. From all its allies, the US was most interested in France - according to the 1985 version of the NSRL, which fell in the hands of East Germany and was eventually returned in 1992. TOPI_Add_Date: According to Wikileaks this is the date of tagging of the entry with the responsible TOPI. These dates seem to be in the format yymmdd, which means they are either December 14 or December 15, 2010. Priority: The priority of the particular Information Need, likely derived from the National Intelligence Priority Framework (NIPF, a reconstruction of which can be found here). This is a huge list containing all countries and topics the US government wants to be informed about, and which prioritizes these topics with a number from 1 (highest) to 5 (lowest). 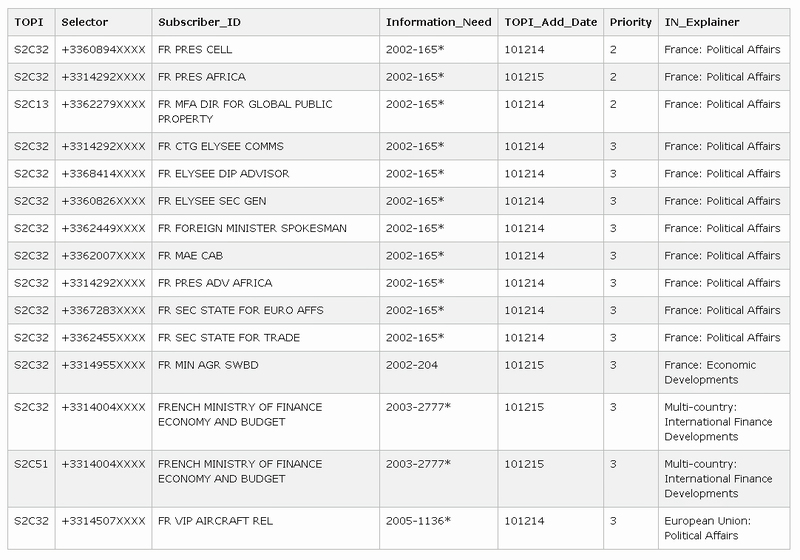 As we can see in the Wikileaks-list, for France, only the president and the director for global public property of the ministry of foreign affairs have priority 2, the rest is medium level 3. Because for Merkel only this record was available, and no finished intelligence reports like those about the French presidents, there is no hard proof that NSA succesfully intercepted her communications. 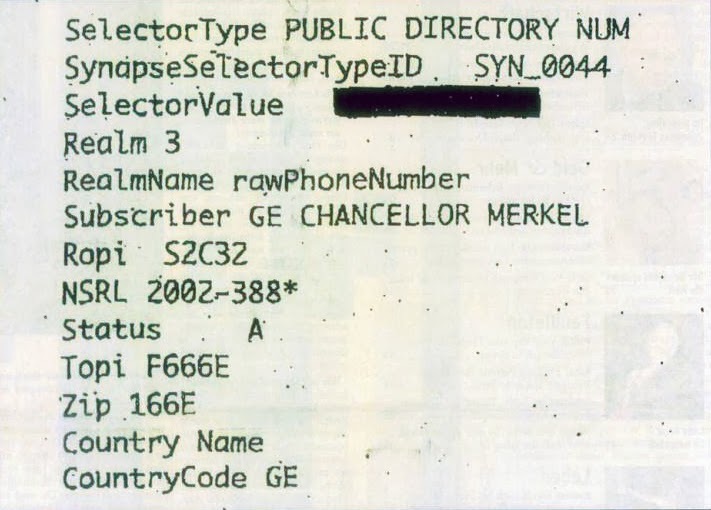 What many people don't realize, is that this database record about Merkel wasn't from the Snowden-documents. Der Spiegel received it from another source that was never identified, which was confirmed by Glenn Greenwald and Bruce Schneier (this seems to exclude the option that someone with access to the Snowden-documents leaked this on his own). Because the tasking records about France are very similar, and most likely from the same database as the one about chancellor Merkel, it's very well possible that they are from the same source. Because keeping an eye on foreign governments is a legitimate task, this source is not a whistleblower. He or she could be a cryptoanarchist, or maybe even an agent of a foreign intelligence agency. Perhaps Wikileaks itself also doesn't know who the source is, because last May, it relaunched its secure TOR-based drop box that allows anonymous submissions of sensitive materials. During his work for the NSA, Edward Snowden was not involved with European targets. He was based in Japan, and later in Hawaii, where they are responsible for the Pacific region. His last job was supporting the regional NSA/CSS Threat Operation Center (NTOC), which counters cyber threats. This is reflected by the intercepted content that Snowden apparently did had (legal) access to, according to a report by The Washington Post from July 5, 2014. These intercepts came "from a repository hosted at the NSA’s Kunia regional facility in Hawaii, which was shared by a group of analysts who specialize in Southeast Asian threats and targets". French prime minister Manuel Valls strongly condemned these spying activities, but that was of course just for show. 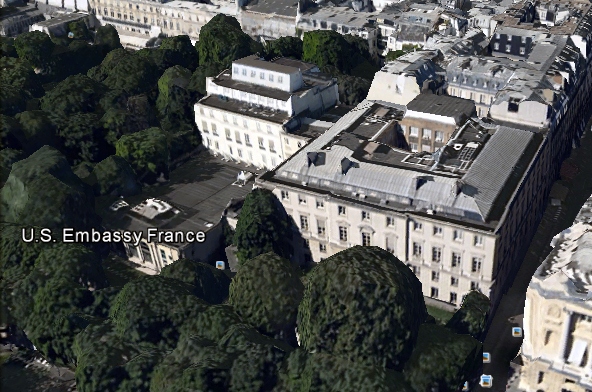 France's own foreign intelligence service DGSE is well-known for its aggressive industrial espionage against American and German companies, and for example also targeted former US president George W. Bush and foreign secretary Madeleine Albright. On the other hand, the French government was well aware of the security risks, as in 2010 it ordered over 14.000 secure mobile phones, to be used by the president, ministers and high officials of the armed forces and the various ministries that deal with classified defence information. A spokesman of the US National Security Council (NSC) told the website Ars Technica that "we do not conduct any foreign intelligence surveillance activities unless there is a specific and validated national security purpose. This applies to ordinary citizens and world leaders alike". Later he added: "We are not targeting and will not target the communications of President Hollande." Just as in the case of German chancellor Merkel, the past tense misses, which means the US government doesn't deny that the French president had been eavesdropped on in the past. But it seems that at least for the near future, both leaders will not be targeted by NSA anymore. Recently, a mysterious telephone was offered for sale at eBay. 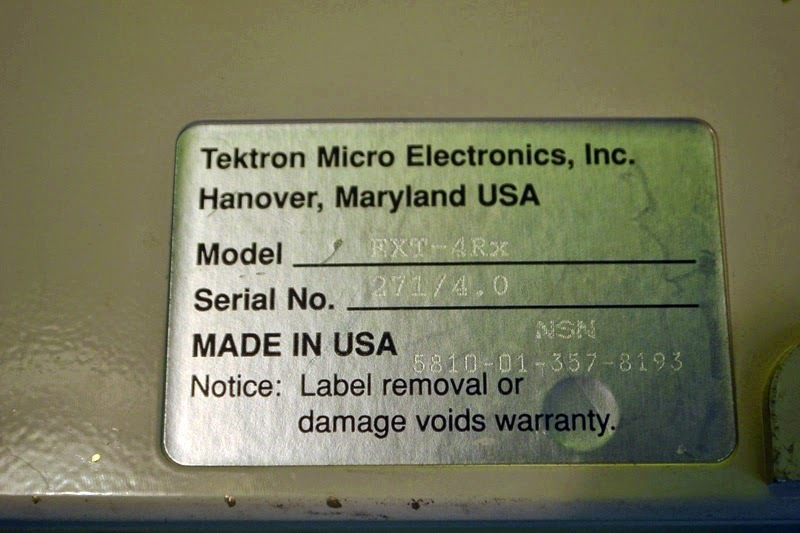 The device was made by the little-known company Tektron Micro Electronics, Inc. from Hanover, Maryland, and seems to be a secure phone for military use. It seems the small button with "2nd" can be used to select the functions which are marked in blue above the standard buttons. 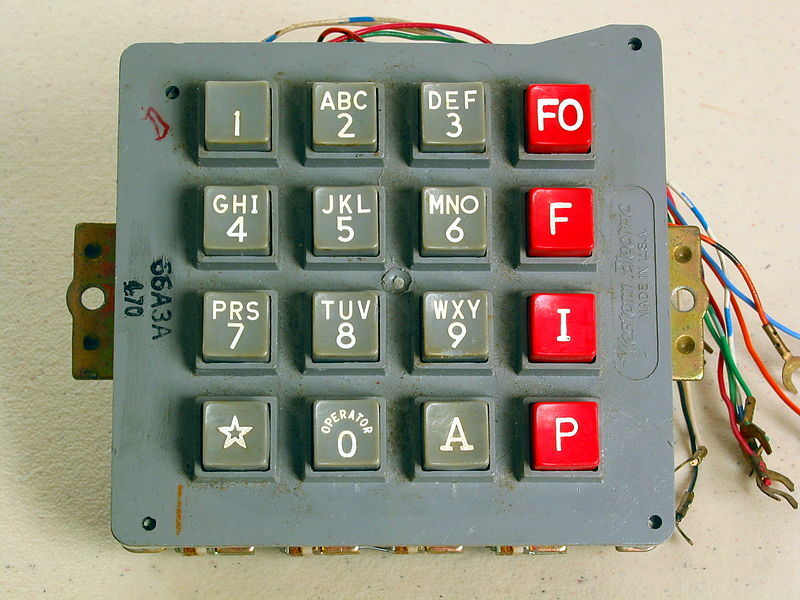 Most interesting are the FO (Flash Override) designation above the "3", the F (Flash) above the "6", the I (Immediate) above the "9" and the P (Priority) above the "#" button. FO, F, I, and P designate the four levels of a system called Multilevel Precedence and Preemption (MLPP), which allows to make phone calls that get precedence over ones with a lower priority. Flash Override (FO) was designed to allow the US President and the National Command Authority to preempt any other traffic in the network in case of a national military emergency. 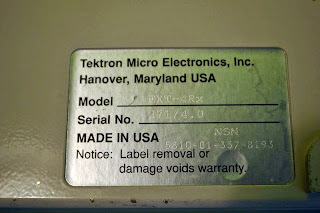 So apparently, the Tektron phone was intended for use on the military telephone network, but why it doesn't have the standard AUTOVON keypad is a mystery. We also don't know when the phone was manufactured. The only indication is provided by the label on the back of the device. It says the model number is EXT-4Rx and has the serial number 271/4.0. The seller had a second device with serial number 111. It's not known where exactly this phone was used, which is an even bigger question because in the 1990s secure telephony for the US government and military had largely been standardized after the introduction of the STU-III family of secure voice products. Motorola and AT&T each made a few hundred thousand of these devices. Tektron is not known for having participated in the STU-III program. 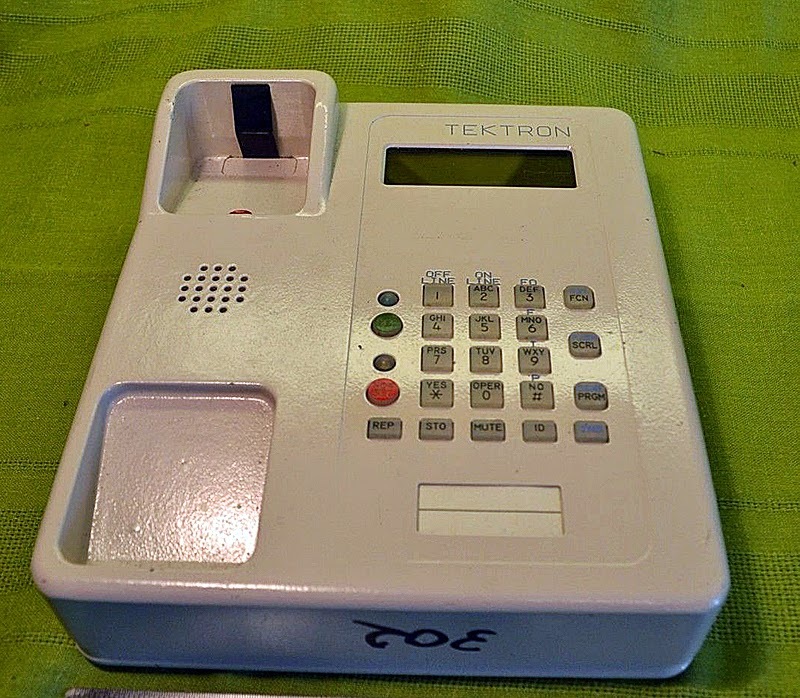 The Tektron secure phone measures 7.75 inches (19,6 cm) wide, a little over 9 inches tall (22,8 cm) and 2 inches (5 cm) thick. The encryption function made it very heavy: it weighs about 5,5 pounds (2,5 kg), as the case is fully made from cast non-metallic metal, perhaps aluminum. Such a metal encasing prevents electromagnetic radiation from being intercepted from the outside (TEMPEST). The STU-III, and the newer STE phones only have their bottom part out of metal, with the upper part out of plastic. Meanwhile, a photo was found showing that the mysterious Tektron phone was actually used aboard the E-4B aircraft, which is a highly modified Boeing 747-200, officially known as the National Airborne Operations Center (NAOC). As such, the plane has robust and sophisticated communications equipment as well as the capability to be refueled in flight. 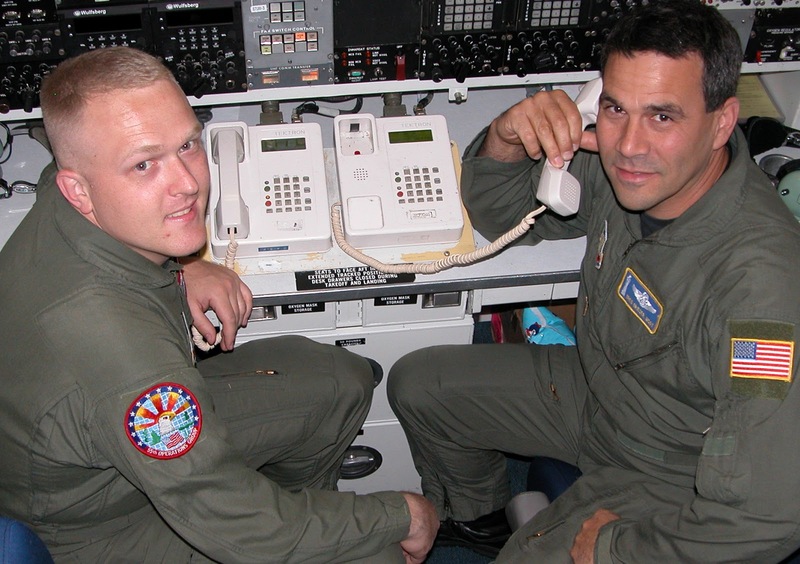 As can be seen in the following video tour inside an E-4B aircraft, the Tektron phones were replaced by a modified smaller version of the Integrated Services Telephone (IST), made by Raytheon. 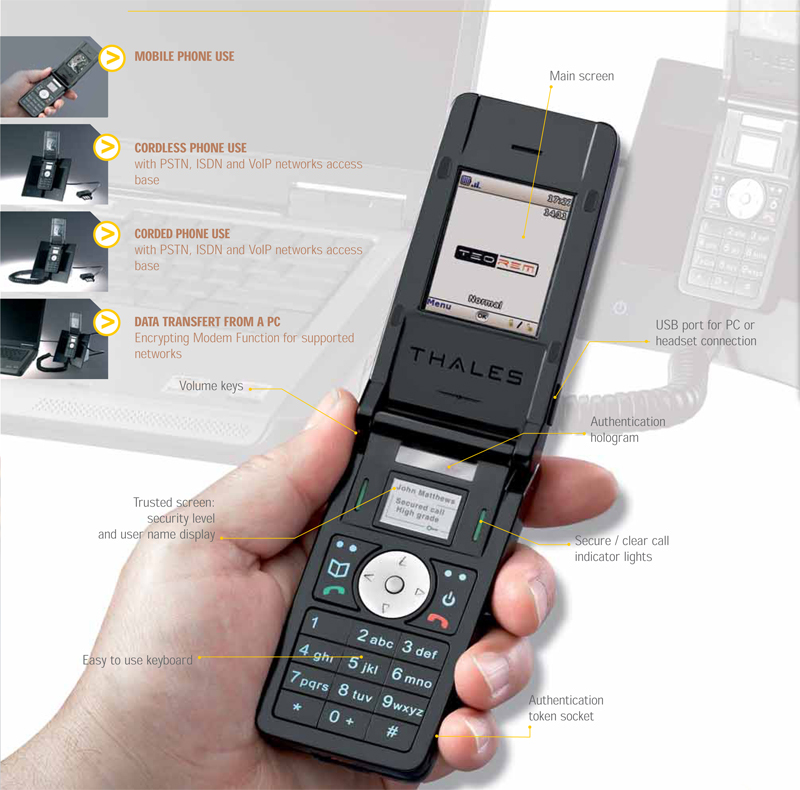 These phones were seen on the aircraft already in 2008. 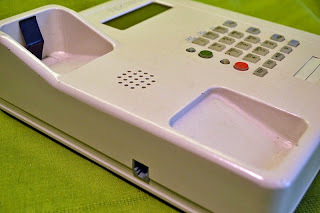 Unlike the Tektron phone, the IST itself has no capability to encrypt the calls - that's done centralized at the local switch, in this case likely by a central network encryptor. 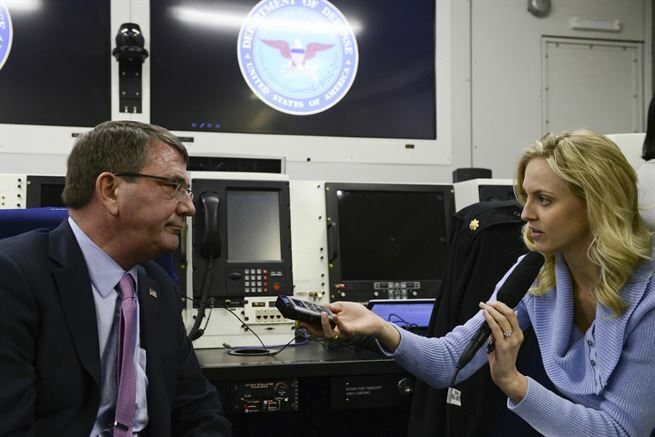 Currently, there are black telephone units with a large touch screen installed aboard the E-4B, as can be seen in pictures from inside the aircraft during defense secretary Ash Carter's trip to Japan on April 6, 2015. 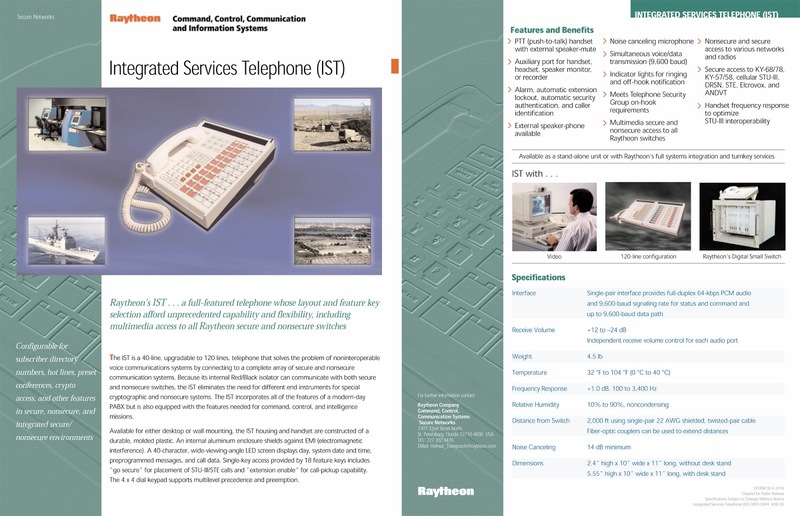 These phones could be custom-made by Telecore, Inc., a small company that also manufactures the IST-2 telephone for the secure defense network.